experience in food processing. He starts a tour of the plant alongside sacks of locally grown peanuts. On a humid morning in November, Guy-Thierry Nyam welcomed visitors to the Nourimanba Production Facility in Corporant, Haiti. Dressed in a red polo and blue jeans, the native Cameroonian and new factory director easily blended in with workers filing into the air-conditioned facility. He peered through a set of windows in the lobby’s adjoining conference room to see a handful of employees, dressed in white lab coats and hairnets, preparing for the day’s first batch of Nourimanba—the nutrient-rich peanut paste used to treat malnourished children at PIH clinics. In Haiti, 1 in 5 children suffer from malnutrition. They may eat once a day, if their families have the means, and that meal usually consists of plain rice. Maybe a potato. Neither is enough for anyone to survive on nor contain the necessary nutrition, particularly for a child whose mental and physical capacity will be greatly stunted if they don’t have enough to eat within their first few years of life. PIH is dedicated to addressing malnutrition and, thanks to its partners Abbott and the Abbott Fund, found a local, sustainable response by building the Nourimanba Production Facility four years ago. The Nourimanba produced here is distributed to PIH’s 12 clinics throughout the Central Plateau and lower Artibonite. 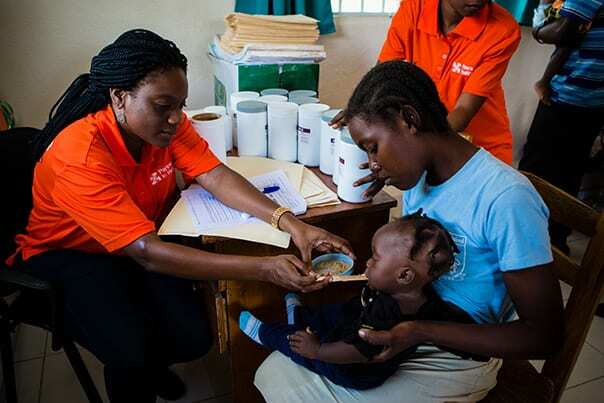 At each clinic, children are weighed, measured, examined, and—for those found severely or moderately malnourished—their families are given a supply of Nourimanba to take home. The enriched peanut paste is a food supplement, but it is treated like medicine. As it should be; it saves lives. Alice Regis and Marie Elizabeth Guerrier sort out damaged peanuts along the production line. When Nyam arrived in September, he was excited to further strengthen efficiency and production at the facility, and to work with a staff of energetic employees eager for his leadership and guidance. Their new director, who has the build of a linebacker and the patience of a schoolteacher, got to work immediately and scaled up production within the first few months. 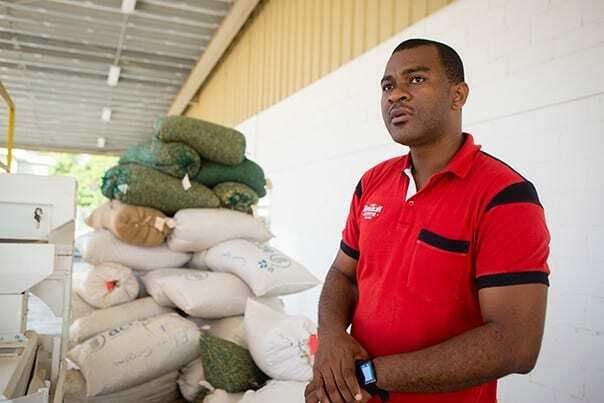 Before joining Zanmi Lasante, as PIH is known in Haiti, Nyam worked in Cameroon for four years as a packing shift manager for Diageo, a multinational manufacturer of alcoholic beverages such as Johnny Walker whiskey. He logged another seven years as a production manager for Barry Callebaut, among the world’s largest chocolate and cocoa suppliers. Most recently, he was plant director at oil and gas producer Technoseal in the Republic of Congo before taking over the Nourimanba plant. Nyam led visitors out of the lobby and around the perimeter of the plant. He pointed to two generators (electricity is, at best, spotty in Haiti) and a water filtration system that feed the facility. At the back of the building was the entrance to the peanut warehouse. Inside, hundreds of bags of peanuts—all locally grown—were stacked atop wooden pallets. All the sacks are labeled by origin, variety, and date of arrival, he explained. Each sack is emptied into a machine that sorts out stones and other debris. If necessary, the peanuts are dried to ensure proper levels of humidity. Then the peanuts are dumped into a towering Dr. Seuss-like contraption that de-shells and drops them onto a conveyor belt. Four employees with eagle eyes and quick hands sort out “stressed” or damaged nuts. In other plants, machines would perform this seemingly tedious task. But job creation had been a central goal of the project from the beginning. And the factory has done just that. About 50 people work at the facility now, including six supervisors. Once the sorting is completed, the peanuts are tested in the chemistry lab to check moisture and aflatoxin levels. Aflatoxin is a carcinogenic mold that can grow on peanuts, so the test ensures that only quality peanuts are used in production. Sourcing better peanuts is possible when farmers have the necessary tools to increase the quality of their peanuts, which includes being able to carefully store harvests. Off a neighboring hallway, employees poured buckets of sorted peanuts into a roaster. The process decreases humidity, reduces contaminants, and develops the nuts’ aroma. The roasted and cooled peanuts are then ground and combined with a few other ingredients in an industrial-sized stainless steel mixer in the production room. In goes canola oil, powdered milk, vitamins and minerals (including vitamin A and iron), and sugar. Workers then fill and carefully apply a “Nourimanba” label on the 32-ounce containers. 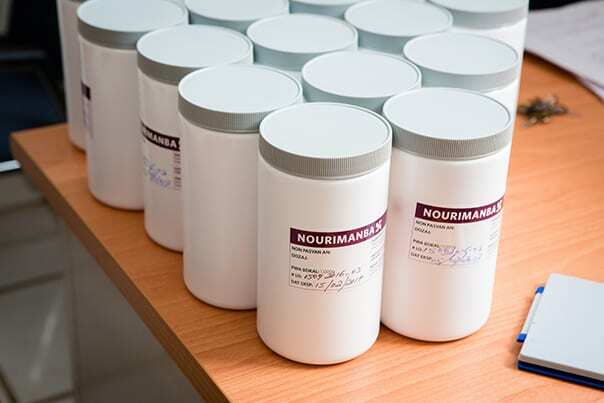 Each label includes a list of ingredients, production date, and batch number to ensure the container can be tracked. peanut paste enriched with essential vitamins and minerals. The air outside the production room was especially thick with the smell of sweet peanut butter. Nyam opened the door of a storage closet, where floor-to-ceiling shelves held cardboard boxes full of Nourimanba containers, which remain there until additional laboratory testing—performed in the onsite microbiology laboratory—rules out the presence of pathogens, such as Salmonella and E. coli, and confirms they are safe for consumption. Timing is everything in the production of a perishable good. 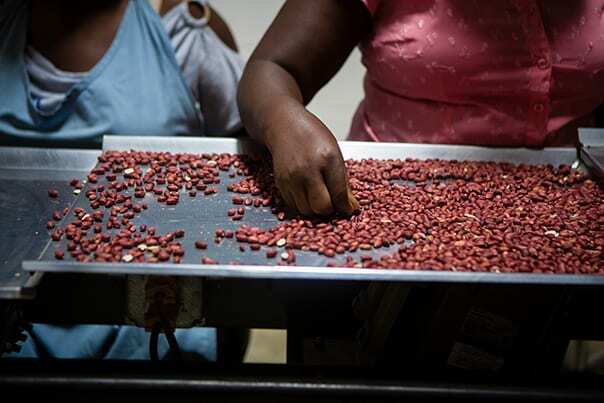 Most Nourimanba ingredients, including all the peanuts, are sourced in Haiti to support the local economy. But some ingredients, including canola oil and vitamin mix, cannot be reliably and cost-efficiently sourced locally, so the plant does import some supplies. Raw materials can take up to four months to import from the United States, and another two months just getting through the red tape at Haitian customs. Delays mean goods with a short shelf life, such as canola oil, have only six months before going bad. To avoid stock-outs following such delays, Nyam made Gouby Dorzin, one of his supervisors, accountable for purchasing perishable ingredients. He also found suppliers in Haiti and the Dominican Republic as back-ups, should U.S. imports get stalled. The Nourimanba plant has been running eight hours a day, five days a week. It’s well on the way to meeting this year’s production goal of 120 metric tons. It has been so successful, in fact, that Nyam is offering other goods and services in the near future. He knows the plant can produce “spicy” peanut butter (popular in Haiti) and offer a range of pre-production services, such as peanut blanching, to fellow manufacturers (something the plant already does for at least one local company). PIH staff would like to one day produce organic peanut butter that can be sold in the United States. Having someone like Nyam around makes that goal all the more attainable. Ms. Esther Mahotiere, a nutrition program coordinator in Haiti, feeds Nourimanba to 8-month-old Wisline Sauvene at the malnutrition clinic in Boucan Carré. First, though, Nyam wants to ensure children are continuing to get the Nourimanba they need, when they need it. PIH-supported malnutrition clinics in Boucan Carré and Lascahobas prove he’s achieving that goal. Nurses proudly display medicine cabinets fully stocked with the nutritious medicine. Back in the factory conference room, Nyam gazed at the bare walls over a cup of coffee and a sample of Nourimanba. (It was the first time he’d tasted the sweet, peanut-buttery concoction.) Someday, he’d like to see the blank space replaced by posters of children enjoying giant spoonfuls of Nourimanba—not so much for his own sake, but for that of his employees.